You will soon be able to fly silently and with zero emissions in electric aircraft, just like electric cars. (But not flying cars, because that’s a terrible idea.) Airbus has developed a futuristic new prototype to demonstrate emerging green technologies. Even if you would never dream of stepping foot in such a small aircraft, this is a glimpse at flight’s future. The Airbus E-Fan electric prototype is a two-seater light aircraft that first flew in April 2014. The aircraft’s structure is all-composite, with a maximum takeoff weight of just 1,213 pounds. It has an estimated top speed of 136 miles per hour, with a cruising speed of 99 miles per hour. The twin 60 kilowatt electric motors draw power from 250-volt Kokam lithium-ion polymer batteries and offer an hour’s flight time. As battery technology continuously improves, the range of an electric aircraft like the E-Fan would also be expected to increase. The batteries are contained in the inboard section of the wings (where fuel tanks would normally be), which join to the bottom portion of the fuselage, and can be re-charged in one hour via a ground charging station, or be swapped out for new cells. The E-Fan dramatically improves safety by totally eliminating flammable aviation fuel from the equation. Fewer combustibles onboard an E-Fan significantly reduces the risk of injury or death for pilots, passengers, first responders and others. While the E-Fan prototype features tandem seating, the production version (to be called E-Fan 2.0) will have seating side-by-side and is expected to reach the market in 2017. A larger model with electric/jet fuel hybrid propulsion and seating for four, the E-Fan 4.0, is also under development and could arrive by 2019. Beyond the E-Fan 4.0, Airbus could eventually bring a 90-seat regional jet called the E-Thrust to market that would incorporate advanced technologies proven by the E-Fan 2.0 and 4.0. There have even been rumors of an electric helicopter from Airbus based on E-Fan technologies. These aircraft aren’t expected for many years in the future, but will certainly be noteworthy when they finally emerge. A distinguishing feature of the E-Fan prototype are the twin centrally-mounted variable-pitch ducted fans. Ducted fans are known for having reduced noise signatures and offer efficiency gains by reducing losses in thrust from the tips of fan blades, all while being able to operate at higher rotational speeds. Because the fans are centrally-mounted on the E-Fan prototype aircraft and have variable-pitch (i.e., the pilot has the ability to direct the fan’s thrust by rotating the fans around their long axis), the E-Fan is said to be very responsive to control inputs. European aircraft noise standards have historically been more stringent than those of North America, as evidenced by large mufflers on European general aviation aircraft. In the United Kingdom, the Civil Aviation Authority (CAA) receives around 2,000 noise complaints on an annual basis, with half of them stemming from general aviation activities. On June 10th the Environmental Protection Agency announced that new emissions standards for commercial aviation are on the horizon. While it remains to be seen what exactly the new standards will entail, and whether they will be more or less strict than international standards, it is abundantly clear that carbon output from commercial aviation will continue to fall under under increasing regulatory scrutiny. The European Commission has set forth ambitious goals as part of the comprehensive “Flightpath 2050” initiative, calling for a 65 percent reduction in aircraft noise and 90 percent reduction of aircraft nitrogen oxide emissions by 2050, relative to capabilities of typical new aircraft in 2000. Aircraft such as the Airbus E-Fan are pioneering technologies that will allow industry to eventually eliminate carbon emissions altogether. Fuel is a leading operating expense of all airlines and flight operations. According to AirNav.com, domestic prices in the last 30 days for Jet A fuel averages $4.98/gallon, while 100 octane aviation fuel averages $5.72/gallon. Fuel costs for a student pilot or commercial certificate holder accumulate very quickly, with the variable cost of fuel being a historical barrier for students attempting to earn pilot credentials. The E-Fan 2.0 will be positioned towards flight school customers, which could make the cost of earning a pilot’s license far more affordable for far greater numbers of students by eliminating fuel costs altogether. Improving access to flight training is a great thing and electric aircraft may be the perfect technology to galvanize a new generation of aviators. The hybrid E-Fan 4.0 will be positioned for the general aviation market and could also be disruptive, potentially offering owners incredible value with significantly increased fuel efficiency. While the Airbus E-Fan is a remarkable new aircraft and incorporates a host of advanced technologies to offer a quiet and sustainable flying experience, it is not the only light aircraft concept with seating for two that is changing the way we fly with electric propulsion. As early as 2011, flight school Embry Riddle experimented with a hybrid propulsion aircraft called the Eco-Eagle, a modified Stemme S10 motor glider that takes off with a standard gas-powered motor optimized for climbing and then switches to a 40-horsepower electric motor once airborne for cruising. 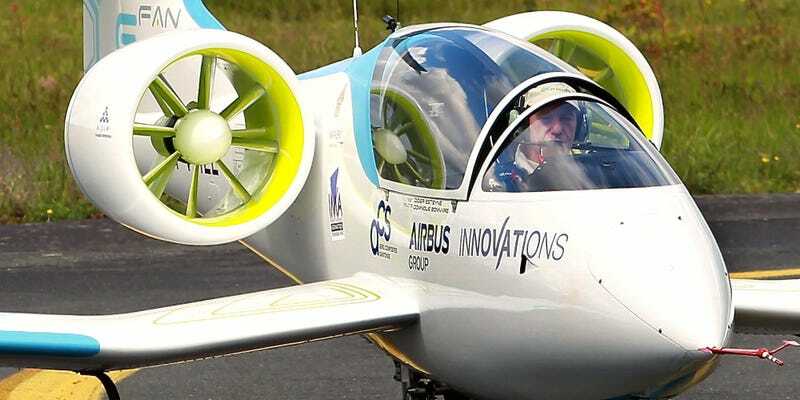 In 2013, Siemens and EADS (at the time, EADS was Airbus’ parent company) flew a two-seat hybrid electric prototype with a range of 900 miles. Pipistrel, a Slovenian manufacturer, currently offers a two-seat electric light aircraft for sale called the Taurus Electro G2 with a retractable engine and main landing gear. An American company called AeroElectric Aircraft Corp. (spun off from Bye Aerospace) announced in 2014 that they would bring a solar electric two-seat aircraft called the Sun Flyer to market. The Sun Flyer features solar panels embedded in the composite wing’s upper surface as well as lithium ion batteries to feed an emissions-free electric motor. AeroElectric Aircraft Corp. describes significantly reduced maintenance costs and increased time between overhauls and inspections as another major benefit of electric aircraft propulsion. Embry Riddle’s Eco-Eagle taxis during the 2011 Green Flight Challenge. The future of flight could be more affordable, comfortable, quiet and safe thanks to technological developments from leading manufacturers such as Airbus. The flight school and general aviation markets will soon see disruptive electric products like the E-Fan 2.0 and others evolve the flight experience, in the same way that electric cars such as the Tesla Model S has begun to do for ground transportation. Embracing this change will usher in cleaner skies and a healthier, safer environment, and could represent the difference between an aspiring pilot being able to afford their license or not. There is no doubt that electric aircraft such as the Airbus E-Fan have the potential to revolutionize the world of aviation. In doing so they could make flight far more accessible than ever before, while also setting new standards for safety and sustainability and eventually sparking new possibilities in the air travel industry.